Here are a few hand picked links to LTE tutorials. Click here for the complete list. Rohde & Schwarz‘s 14-part presentations provide an excellent introduction to LTE. The presentations start with a background on LTE. This is followed by lectures that cover LTE frequency bands, OFDM, OFDMA, SC-FDMA and LTE signaling. The lectures also cover channel mapping and UE categories. An excellent overview of the LTE physical layer. 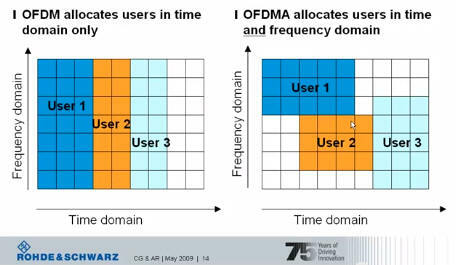 Get an overview of OFDM and SC-FDMA transmit and receive chains. LTE channels and reference signals are described in detail. Highly recommended. This article describes the LTE link-layer protocols, which abstract the physical layer and adapt its characteristics to match the requirements of higher layer protocols.The LTE link-layer protocols are optimized for low delay and low overhead and are simpler than their counterparts in UTRAN. The state -of-the-art LTE protocol design is the result of a careful crosslayer approach where the protocols interact with each other efficiently. This article provides a thorough overview of this protocol stack, including the sub-layers and corresponding interactions in between them, in a manner that is more intuitive than in the respective 3GPP specifications. 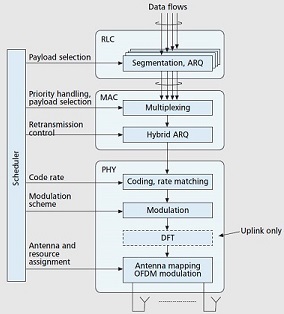 This article provides an overview of the LTE radio interface, together with a more in-depth description of its features such as spectrum flexibility, multi-antenna transmission, and inter-cell interference control. The performance of LTE and some of its key features is illustrated with simulation results. This article provides a high-level overview of LTE and some of its key components: spectrum flexibility, multi-antenna transmission, and ICIC. Numerical simulations are used to show the performance of the first release of LTE, as well as assess the benefit of the key features. Indeed these contribute strongly to LTE meeting its performance targets. An outlook of the evolution of LTE toward LTE-Advanced and full IMT-Advanced capabilities complete the article. Clearly, LTE offers highly competitive performance and provides a good foundation for further evolution. Click here for a more LTE tutorials that cover the entire spectrum of LTE development. Categories: telecom | Tags: 3gpp, antenna transmission, attach, enodeb, ims, ip multimedia subsystem, link layer protocols, lte, lte advanced, mimo, ofdma, pdcp, rlc, rrc, sc-fdma, signaling, spectrum flexibility | Permalink.